I was on a specific mission on this particular visit to Walmart. My husband had sent me to look for a particular game, Rock Band 4. Not the big package, mind you. The one with all the instruments. Not that one. No, I was to get a different version. I think the package was purple. Maybe. Wandering the aisles, I searched high and low, before I realized that I was in the PS4 section. Oops. I finally found the Xbox One section...and Farming Simulator 15. 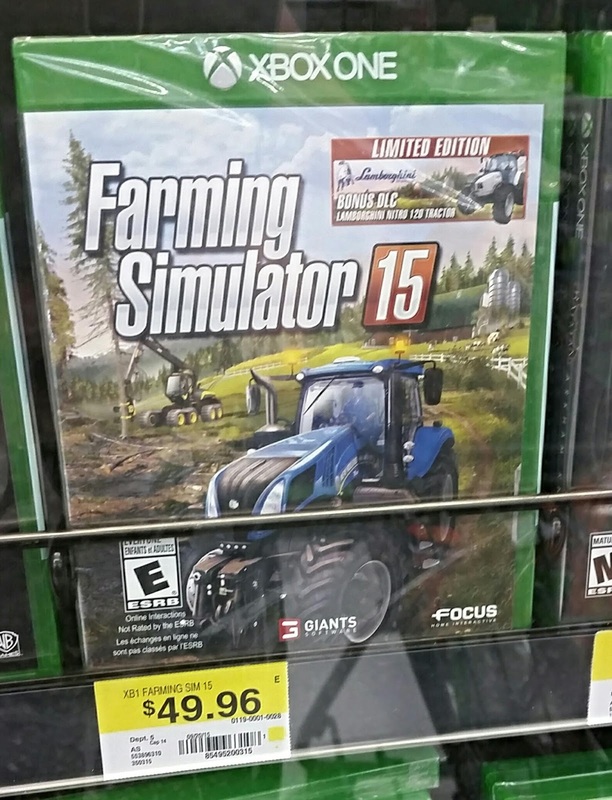 Beside my initial shock at the idea that someone would create a game involving tractors, oddly, came curiosity as to who would buy such a game? My grandfather was a farmer. There were animals to feed, crops to plant, baby animals to help birth, buildings to repair, and other stuff. Not a whole lot of fun. But I'm certainly not the center of the universe, that my wishes alone are what drives the market. And likely that is a good thing. Everyone relaxes in their own way. 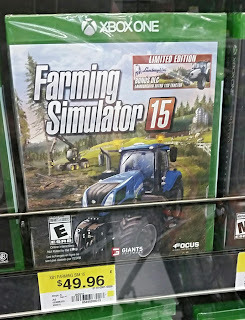 Obviously, someone else did think that a game about driving tractors would be fun. They wouldn't have created the game, otherwise. And Microsoft must have thought it was a good idea, otherwise they wouldn't have agreed to market this game as one of their own. Somebody must have looked at this game, sitting there, and said "Hot dang! That sounds like a heck of a good Saturday night!" I suppose that it's an acquired taste. I have to stay away from vid games. I waste a whole mess of time with them. However, farm simulator would have to have some humor to make it in my opinion.